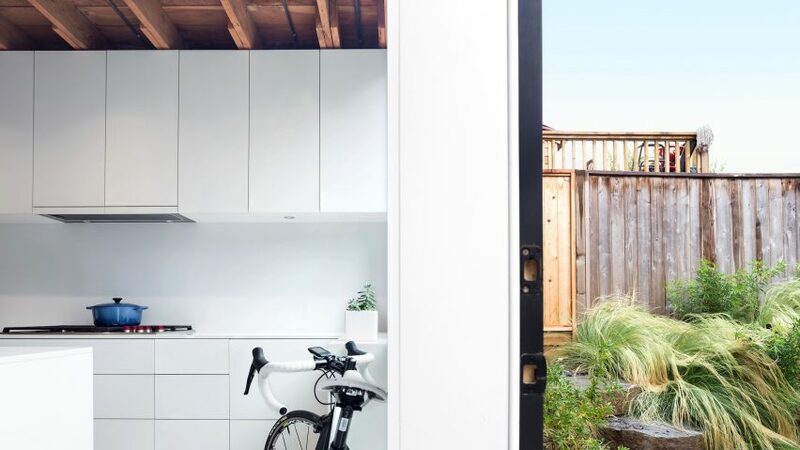 D'Arcy Jones Architecture has renovated a 100-year-old structure in Vancouver, excavating the basement to create new living spaces with direct access to the home's yard. 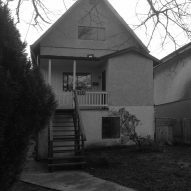 The 480 House is located in East Vancouver, an up-and-coming part of town with a growing cultural scene. The original structure, built in 1901, was in severe need of renovation, and was almost replaced rather than salvaged. The structure had been left without heating for over 20 years, according to D'Arcy Jones Architecture. "It was overrun with rats, and almost tipping over sideways," the local firm said. The structure is quite narrow, as the lot it sits on is only 25 feet (7.62 metres) wide. So to increase the home's usable floor space, its former basement level was lowered and made into a full floor. This allowed the architects to create taller living spaces for the 1,500-square-foot (140-square-metre) residence, and provide room for an open-plan the kitchen, living and dining area. "The main level is a raw and simple space, carved from under this narrow house," said the firm. Upon entering the dwelling from the south, a simple wooden staircase leads up to middle level, which contains the master bedroom and a home office. This staircase continues up to the attic, where two additional bedrooms can be found. Wherever possible, the architects preserved elements of the home that could be saved. The structure's original wooden joists were left exposed, in contrast to the modern materials added during renovation. "All new interior cabinets, handrails and fittings are white, to create a timeless backdrop in contrast with the rusticity of the existing house," said the studio. The most substantial intervention was the installation of a water-heated concrete slab beneath the existing structure, built to offset the chill of having the living spaces directly on the ground. The home's exterior was rendered in stucco, then painted black. "Like a film that oscillates between colour and black and white footage, the minimal exterior of this renovation exaggerates the colours of textures of its working class neighbourhood," said the firm. Despite the significant changes that were made to the home's structure, its basic massing was preserved. "The silhouette of the house is completely retained, keeping the architectural history of the existing house alive," according to the architects. Other projects in Vancouver include a minimalist update to another single-family home by local architects Scott & Scott and a residence that was clad in board-formed concrete, revealing the texture of the wood on the home's exterior. Photography is by Sama Jim Canzian.